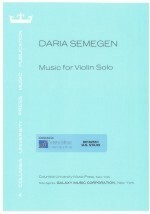 This work for unaccompanied violin was chosen in 1978 by the jury of the International Society for Contemporary Music to represent the United States at the World Music Days Festival in Helsinki and Stockholm. It has been recorded on Opus One No. 59.